It All Starts With A Dance Teacher - And You! Tyler takes his first step onto the stage...And It All Started With A Dance Teacher. Eric finds out he was accepted to college...And It All Started With A Dance Teacher. Melinda pilots the plane down the runway...And It All Started With A Dance Teacher. 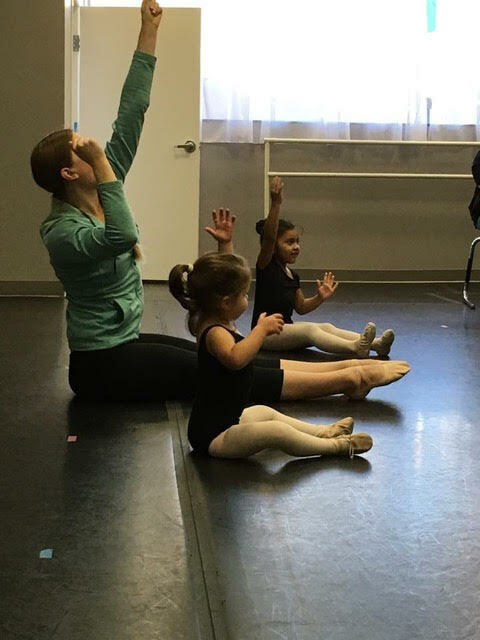 Whitley makes her own way as an educator...And It All Started With A Dance Teacher. 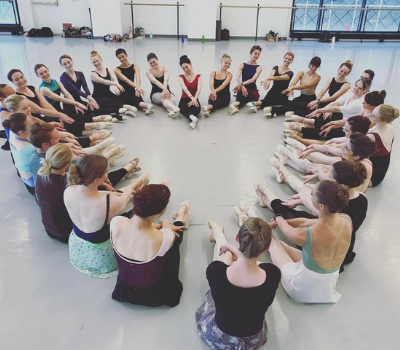 For these and millions of other students, success in and out of the dance studio starts with a dance teacher. When you donate to NDEO, you support those often unsung teachers who make tremendous impact on the lives of their students, and you ensure that the next generation of students will have access to the quality dance education that can make all the difference in their lives. Help NDEO raise $10,000 for our Professional Development Scholarship Fund this spring. With your support, we will double the number of scholarship offered and increase the value of each for 2019 and beyond. Your donation will directly benefit dance teachers who demonstrate both professional merit and financial need, and help them have a lasting impact on students like Tyler, Eric, Melinda, and Whitley. “I began to study dance as a newly enrolled student at County Prep High School, without any training beforehand. I didn’t understand the massive impact it would have on my life at the time - all due to my first dance teacher Heather Warfel Sandler. Dance became my golden ticket to university. The art instilled in me a passion that was infectious, a curiosity that was insatiable and put me on a conveyor belt I didn’t know existed; ultimately bringing me to parts of the world I had only read about, dancing on stages I’ve only seen as an audience member, and leading me to my beautiful dancer wife.” - Eric Ortega, Line Producer at NBC News and Choreographer at In Motion Dance Co.
Research and anecdotal evidence indicates that dance, when taught by a qualified dance educator, contributes to students’ physical, emotional, and social well-being by providing a form of physical fitness, an outlet for personal expression, and a means to develop empathy and social-emotional skills. Students who study dance acquire 21st century skills such as collaboration, communication, and creativity, and dance has been shown to positively affect students’ attitudes, perceptions, and values. When integrated into the PreK-12 curriculum, dance keeps students engaged in school, enhances learning when integrated into academic subjects, and improves overall school culture. Whether students go on to become professional dancers or apply their skills in other fields, they owe it all to the person who supported their interest, guided their training, and encouraged their dreams … It All Starts With A Dance Teacher! 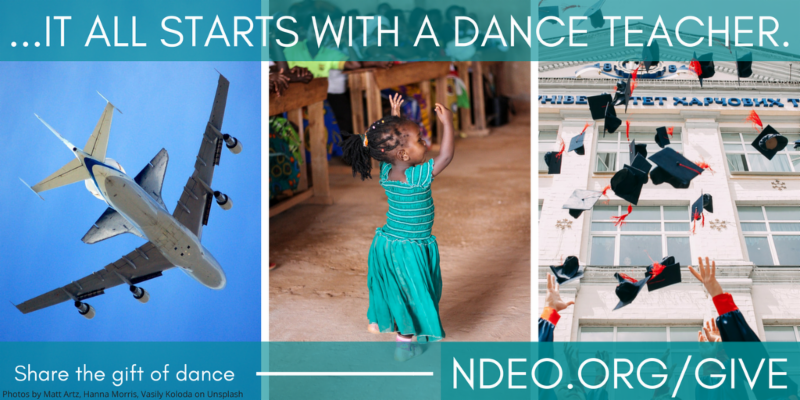 It All Starts With A Dance Teacher...And NDEO! Too often, dance teachers do not have access to the resources they need to provide a quality dance education for their students. In PreK-12 schools, dance programs are often underfunded, and teachers must continually fight for dance to be recognized as an important part of the school curriculum. Dance teachers in all environments are often undervalued and underpaid, as the dance field lacks the funding and prestige of other art forms. They lack resources needed to advance their careers, such as professional development. They must un-learn and work against traditional teaching practices that can lead to student injury or emotional damage. They frequently work in isolation, as the only dance teacher in their school or only studio in their community. They are so often unseen and unrecognized, working tirelessly for their students’ success behind the scenes. 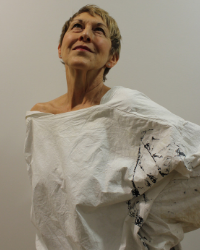 Why Do Dance Educators Turn to NDEO? It All Starts With A Dance Teacher...And You! None of our work on behalf of dance teachers and their students would be possible without your support. Your donations help us provide scholarships for dance educators with financial need to attend our conferences and take our online courses. They, in turn, will bring what they learn back to their students, studios, and schools, creating a broad and lasting impact in their communities. We need your support, now more than ever. As budgets for school arts programs dwindle, dance is often the first program cut. NDEO is there on the front line, working with states to advocate for dance in their schools. As more emphasis is placed on highly qualified teacher status, dance teachers in particular need access to continuing education. NDEO is there for them, providing conferences and online courses that help teachers advance their careers. As the world of competitive dance becomes more focused on extreme tricks and aggressive training from an early age, teachers need to be aware of teaching practices that are safe and healthy for all students. NDEO provides the research, the professional development, and the support teachers need to discover and implement these practices in their studios. As STEM becomes a primary focus in higher education, university professors need resources to help them advocate for their dance programs. NDEO is there, with the language and tools to help. For every dance teacher, in every branch of the field, and for all of their students, NDEO is there, but only with your support. Donate today and join with us support to the teachers who make tremendous impact on the lives of their students. Your donation will ensure that the next generation of students will have access to the quality dance education that can make all the difference in the lives. The Annual Appeal is a program of the Decade of Dance Education, a ten-year campaign designed to raise the profile of dance education centered in the arts, while simultaneously ensuring the growth and development of NDEO for years to come. The mission of this campaign is to raise the awareness and funds needed to build and sustain NDEO in our next era of growth, so that we can best support and advance the field.